Drift, slide, skid! Sport Car Racer is the ultimate onlineracinggame that will challenge your driving skills As anexperiencedracer, you will have to manage driving on beautifullrace track,with narrow turns, bridges and tunnels. Keep your carright on theroad and avoid sideways that would make loose speedAvoidcollisions and don't let you get overtaken by the fastcomputerdriven cars or, in the multiplayer online mode, playersfrom allover the world. The game is built on the best vehiclephysicsengine available for real driving sensations and a veryeffectivecomputer driven cars artificial intelligence system. Itfeatureshigh definition 3D graphics, along with rock musics andrealisticsound fx. If you like car games, this one is different,this one isfor you! Main Features: -Offline or Online Multiplayerat no extracost -10 Vehicules simultenaously -12 Sport CarsVehicules tochoose from -Full 3D -Multiple Camera Views -TruePhysics -BestComputer Driven Car Artificial Intelligence-Realistics Sound FXand optional Rock Musics -Leaderboards -EarnBonuses on each Race-Top Racing Game -Best Driving Experience Racenow and show offyour driving skills! Help the frog to reach shore!Jump from rocs to turtles, from turtles to flowers, from flowers towood logs while avoiding the carnivorous crocodiles.Served by superbs animations and 8 bits style sound fx and musics,Frantic Frogger is a full action packed game where playability isput first.You'll be able to register your hiscores and compare yourself toplayers from all around the world, while helping your country toprogress in the froggy international competition. GAME ENGINE FRAMEWORK WITH MOBILE APPLICATIONSPACKAGINGSprite Basic is a HTML 5 Game Engine providing a Basic languageCompiler along with a complete set of functions making writinggames for browser and mobile devices simple and rewarding !SPRITE BASIC IS LIGHTNING FASTBecause Sprite Basic is a Basic Compiler, and not a standard BasicInterpreter, Sprite Basic runs at the highest speed offered bybrowsers/devices. With a very clean instruction set, you'll beamazed by overall performances.HTML5/WEBGL RENDERINGSprite Basic provides user a simple function library witheverything you need to build top-class 2D games. Based on Pixi.js,the commercial-grade HTML5 Web Gl Renderer, the best around for 2DGraphics, it takes the best of the accelerated graphics card of anydevice.AAA PHYSIC ENGINEBuilt in Sprite Basic is a physic engine, PhysicsJS, that providesall behaviours and physical rules allowing to build real-likephysical worlds for all sorts of games like, say, AngryBirds.FULL SET OF BASIC COMMANDSSprite Basic is easy to learn, it is indeed, the easiest toolaround to write games. But with its full set of Basic Commandsalong with its dedicated libraries Sprite Basic offers everythingbest game authoring tools permits to do in a complicated way, justit is simple, straight-forward and fun to learn!STRONG TYPING FOR EASY DEBUGGINGSprite Basic has 6 data types : number, string, boolean, object,list and map, along with a complete set of Data StructuresFunctions to manipulate them. By ensuring strong-typing at compiletime, writing errors free and debugging applications is greatlyfacilitated.WRITE ONCE, BUILD EVERYWHERESprite Basic offer the ability to package applications for web andall mobile devices. Just click Project/Export in the editor window,and start packaging! With a built-system addressing screenfragmentation by automatically adjusting/scaling all screenoperations independently of screen sizes, no porting ofapplications between system is needed, it is all done already!USED IN COMMERCIAL PRODUCTS - PUBLISH YOURSSprite Basic has been used to develop several commercial games,published on mobile applications stores .If you're willing to learn, we can assist you through tutorials andfree support to help you develop and publish your own games.MOBILE PLUGINSAlready in production in released games, and soon publiclyavailable through a future release, are mobile plugins that giveyou all capabalities used in the best mobile games. Examples ofthose plugings are Ad Networks Support (banners, interstitials,rewarded videos), in-app purchases, social sharing, app ratings,leaderboards, achievements.SHARE YOUR CREATION WITH THE COMMUNITYBy logging from your desktop on https://spritebasic.com, you willbe able to upload your graphics and sounds, and keep developingyour creations from your computer browser. You can initiate adeveloppement on mobile, carry on on desktop and test instantly onmobile. You can also share your assets and your projects with otherusers and benefits freely from community assets/projects. Examplesgames source codes, demos, tutorials are available freely to importinto your workspace, along a set of tutorials and a complete APIReference.CHECK FREE BASIC COMPILER FULL GAME EXAMPLEhttps://play.google.com/store/apps/details?id=com.pix.arts.NBlastCODING IS FUN ! GET STARTED NOW ! Drift, slide, skid ! 'Turbo Skiddy Racing', the ultimate 3Dperspective car racing game, makes racing even tougher thanever.You race against up to 7 cars and truck (Ferrari GT 2005,Toyota Celica GT4, Ford Pick Up, Indie Stockcar, FerrariTestarossa, Porshe 911 Carrera, Lamborghini Countach, DAF Truck).As an experienced stunt racer, you will have to manage racing withyour car on bumpers and jumps, narrow roads and even ice (on nightand day tracks). Don't let you get overtaken by the fast computerdriven cars, avoid collisions and win the championships!The game isbuilt on the best vehicle physics engine available for real drivingsensations and a very effective computer driven cars artificialintelligence system. It features high definition 3D graphics, alongwith rock musics and realistic sound fx.If you like car games, thisone is different, this one is for you!3 championships included. Motorsport Manager Mobile 3 is the ultimate race team strategygame. Build up your very own motorsport team from scratch, makingevery big decision. Hire the drivers, assemble the team, developyour car and mastermind your way to glory. • This is your racingteam. Hire drivers, develop your car and invest in technology. •Work with your drivers to achieve the perfect qualifying lap. •Formulate the ideal pitstop strategy to win races. 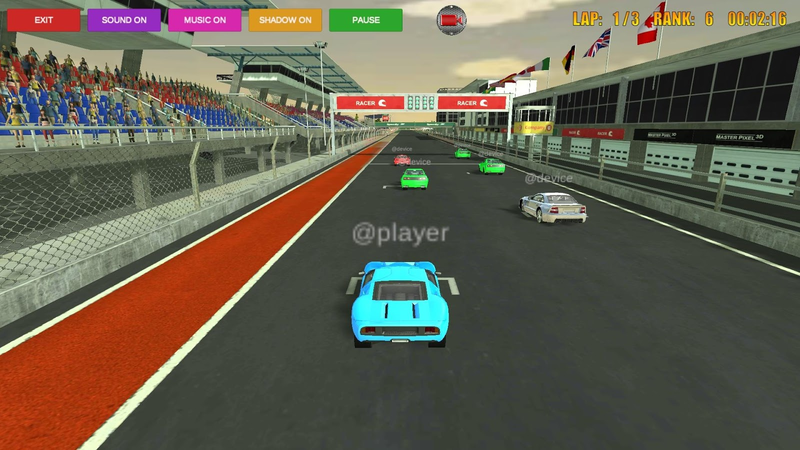 • Watch the racein real-time or jump into the strategy screens to take control ofthe action. • React to weather changes, crashes and safety carperiods. • Win championships across the world to reach the pinnacleof motorsport. New in MM Mobile 3 ===================== GT ANDENDURANCE RACING With 6 new championships, MM Mobile 3 is biggerand better than ever before. GT races bring action-packed,wheel-to-wheel action, while Endurance is a Motorsport Manager’sultimate strategic challenge, with 3 drivers per car and timedraces! A STUNNING SETTING Monaco makes its Motorsport Managerdebut! Manage your cars around la Rascasse, Casino Square and theSwimming Pool. It’s the ultimate test, rendered in a beautiful,detailed new art style. NEW FEATURES The Supplier Network seesmanagers grow their team’s presence around the globe, whileInvitational Races are huge annual events, bringing internationalraces with a unique twist. Mechanics are the new members of yourteam, and their relationship with the driver is all-important! GAMECHANGERS Votes on rule changes, dynamic AI team movement (includingteams going bust and being replaced) and new difficulty settingsmean that the world of motorsport constantly evolves – but thechallenge stays at your level. ON-TRACK ACTION Energy RecoverySystem, with Hybrid and Power modes, mixes up every race! Will youboost your way past your rivals into clear air, or smartly manageyour fuel levels to pull off a genius strategy? Tap to turn right, release to turn left and drift your way to thefinish line! Skiddy Car's one-tap drifting gameplay is simple tolearn and filled with clever new challenges. Complete the levelsand unlock new tracks, new skins and an ever-growing supply ofvehicles! Skiddy Car features: • Simple yet challenging one-tapdrifting gameplay! • Play your way through the range of windingtracks! • A huge collection of crazy vehicles to unlock! •Colourful ways to customise your game! Get on the track and masteryour skiddy skills. NEW Winter Ski Park is now better than ever! Drive 5 new premiumvehicles, discover UI improvements & a new garage! NEW You canexplore the game world at your own pace! Complete new missions eachday to earn in-game rewards! Challenges include: perform amazingjumps, stay in the air as long as possible, find a reward hidden onthe map and more! Download now and discover all new content!Explore the great, majestic winter resort, driving on ice-coveredroads in a variety of exciting, challenging vehicles! Plow throughsnow, drift in a rally car, feel the winter air in a snowmobile ortry to navigate a big, bulky bus! Plentiful exciting challengesawait you! FEATURES: ▶ PICTURESQUE WINTER LOCALE: Explore theinviting, beautiful resort ▶ DAY AND NIGHT CYCLE: Notice how theenvironment changes with the time of the day ▶ 15 COOL VEHICLES TODRIVE: From a small snowmobile to a giant bus with everything inbetween! ▶ REALISTIC GRAPHICS & EFFECTS: Winter driving hasnever felt so authentic ▶ 5 AWESOME PREMIUM VEHICLES TO DRIVE INFREE ROAM! : Try out sports car, truck and the old one! Winter SkiPark: Snow Driver opens to you an authentic-looking, challenginglocation to drive around and prove your driving skills in. Startexploring it in your trusty SUV, getting the hang of navigatingaround the narrow, windy mountain roads. After a bit of practiceyou’ll be able to advance and try your luck in more demandingvehicles. In the course of the game you’ll get the chance to tryout and drive a myriad of exciting cars. From big to small, in allshapes, sizes and utilities. Each one will pose a differentchallenge and ask you to learn new skills. A rally car is fast andeasy to handle, so you’ll be able to drive fast and drift to cutcorners and get to your destination on time. Then to drive a largevan or even a bus you will have to teach yourself to be morecareful and mindful of your surroundings. Feel like a tourist andexplore this exciting, wondrous winter land at your own pace or putthe pedal to the metal and do what you can to beat the record andget the gold trophy for your performance! Whatever your approach,this time spend in the cold will be something to remember! Thewhole game area is meticulously crafted with authenticity and aunique mood in mind. Take a journey worth remembering and enter theWinter Ski Park! Develop and customise your own F1 car from the ground up, or racefor one of the 10 official F1 teams, to challenge opponents fromaround the world to thrilling multiplayer duels. Featuring officialcircuits from the 2018 season, including the return of Hockenheimin Germany, F1 Mobile Racing lets you race against the greatestdrivers on the planet including Lewis Hamilton, Sebastian Vettel,Max Verstappen and Fernando Alonso. It’s you against your rivalwith the simple aim to be the first to the line! •OFFICIAL MOBILEGAME OF FORMULA 1®: F1 Mobile Racing is an official mobile game forthe 2018 FIA Formula 1 World Championship™ featuring all of theteams, cars, drivers and circuits. •REAL TIME MULTIPLAYER: Playfreely with players from around the world in real-time 1v1 races tomake your way to the top leagues. •DEVELOP AND UPGRADE YOUR OWN F1CAR: Collect the appropriate parts to upgrade your car’sperformance and find the best configuration for each Grand Prix™!•STUNNING GRAPHICS: Enjoy the feeling of being a real F1 driverwith gorgeous visuals. •THRILLING RACES: Take part in the greatestracing spectacle on the planet with a console-quality gameplayexperience on your mobile. •TIME LIMITED EVENTS: Race in special‘time limited events’ that coincide with the official F1 Grand Prixand earn exclusive in-game rewards. Pro Series Drag Racing: More realistic, more customizable, morefun! Pro Series Drag Racing - the most realistic and engaging dragracing experience ever created for mobile devices - is finallyhere! Build, Race, and Tune your car until it's at the absolutepeak of it's performance. Get your experience in career mode, thentake it online and go up against the best of the best in onlinemultiplayer play! This is no over produced side-scrolling pseudoracer. This is raw drag racing - NO FLUFF! - just you, your car,and your competitors. LIKE US ON FACEBOOK:http://facebook.com/NoLimitDragRacing Note: The app is brand new,if you find a bug please give me a chance to fix it before leavinga negative review. FEATURES CAREER MODE With 4 different classes ofcars the Pro Series career has something for every gear head.Street cars, Pro Mods, Funny Cars, and Top Fuel Dragsters. Careermode is an in-depth look at what it's like to work your way throughthe ranks of drag racing, and will test even the best driver! FULLCUSTOMIZATION FOR YOUR CARS Pro Series gives you total control overhow your car looks: Custom paint, wraps, wheels, body kits - thelist goes on and on. You can even change the color of the roll barin the Pro Mod cars! There are millions of different combinations,and that lets you get your car the way YOU want it. ONLINEMULTIPLAYER Play other racers from all over the world in onlinemultiplayer play. There are three racing types in multiplayer -Bracket Racing, Heads Up Racing, and Grudge Racing. If you're notfamiliar with these please look them up before attempting a race!These races are TOUGH, and are wagered races. TUNE YOUR CAR In ProSeries you get complete control over the gearing, rev limiter,suspension, timing, fuel delivery, boost, and launch control ofyour car. The included dyno allows you to test changes made andmake sure you're going the right direction! The tuning is almostunlimited - Want to run a tall first gear with a short rear? Youcan! Want to launch on the limiter? You can! The tuning aspects areso in-depth that you can even adjust how high off the ground yourwheelie bar is! Mess up your tune? No worries - just visit themechanic and he will reset you to a base tune. Pro Series alsogives you an unlimited amount of Test-n-Tune races to make sureyour car is the best it can be. MODIFICATIONS In Pro Series youwon't survive long running around in a stock car. So we've givenyou over 300 different modifications across the classes to keep upwith the rest of the racers. Different engine blocks, intakes,valve trains, exhausts, tires, etc... As you modify your car youwill have to keep up on your tune as each modification slightlychanges your car's ability. To stay at peak performance, make sureyou're constantly testing and tweaking your tune - or hire a CrewChief and they'll take care of it for you! FREE Pro Series DragRacing is ad supported, and completely free to download. If youwant to disable ads, all you need to do is purchase gold within thegame. Ads will be disabled with *ANY* purchase of gold in the game! [ATTENTION] Race any YouTube video or play your own local musicfiles [ATTENTION] PC version:https://store.steampowered.com/app/893030/Music_Racer/ Music Raceris a music-adapting racing/runner/action game where you use yourown music to race! The shape, the speed, and the mood of each rideare determined by the song you choose. Rush along the fantasy trackin your car or fly along the space tunnel to the sounds of yourfavorite music. Gather beats, catch the rhythm. Get ready for abreathtaking race along the unique tracks of this Android game.Listen to your favorite music on your device. Each music track youselect will influence the time of a round, length of a track andmovement speed. Listen to the beats of music and maneuver in orderto pick up beats flying by. Try yourself on different tracks andsurf the audio! Listen to your favorite song while playing andcollect gems to catch the beat! - Different levels - Many vehiclesto choose from - Vehicle customization, color your car or rims! -Great visual effects, one of the best graphics on Android -Retrowave, vaporware, hi-fi, neon, cybernetic and geometry designedenvironments - YouTube support - Different game modes: classic,zen, hard and cinematic The game may use music files on yourdevice. We do not take responsibility for any copyright issues. Escape as long as possible in endless levels! Secrets, power-ups,unlockable cars and plenty of other surprises wait for you in are-imagined version of the classic original car chase game, PAKO -Car Chase Simulator! FEATURES: + Easy and addictive gameplay +Generative map is different each time played + Play in bothportrait and landscape mode + Use wacky bonus items and find secretareas! + Unlock cars + Leaderboard competition + Achievements +Cloud saving MANUAL: 1) Press and hold touch screen LEFT and RIGHTsides to steer the car. Hold BOTH buttons for extra slide. 2) Ifyou manage to collect special item box, use it by DOUBLE TAPPINGthe screen. Avoid driving into any obstacles, but just drive aslong as you can. The level regenerates on every run. There'ssometimes also wacky "secret" locations to encounter.